Tell us about your film. What inspired you to make it? My film is titled Dol (First Birthday). It is in the US Narrative Shorts category at Sundance this year. 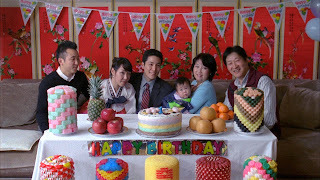 The film is about a gay Korean-American man who attends his baby nephew's "dol," a traditional Korean first birthday celebration. I made the film to come out to my parents. I wanted to show my parents a complex portrayal of a gay Korean-American man, someone they could sympathize with. I thought that by showing them a film, I could give them a better understanding of who I am. How long did it take you to make your film? The entire process took about a year and a half. How did you finance your film? I self-financed my film, but found many ways to save. I received a lot of support through my school, CalArts, and also looked for unique programs like Panavision's New Filmmaker's program that help offset costs for low-budget productions. What was the most challenging part of the filmmaking process and how did you overcome it? The most difficult part of the filmmaking process for me was the edit. I struggled with the fact that I knew I was going to come out to my parents by showing them the film. I felt like I had to make the perfect film, a film so good that they could accept their gay son. It was excruciating! I had to compartmentalize. When I was in the edit room, I was editing, trying to shape story and character. I couldn't worry about my parents. Getting into Sundance has really helped me find motivation to keep going. Filmmaking feels less and less like a hobby, more and more like a career. If you had to make the film all over again, would you do anything different? No, I've learned so much by making this film, artistically, personally, and professionally. Dol (First Birthday) does not have distribution yet. I hope to secure that soon! However, it will be playing in the festival circuit throughout the next few months. Hopefully it plays in a town near you! Can you provide any advice to other filmmakers who dream of getting their films made and into Sundance? Make personal work -- films that you are passionate about, that are unique to your experiences. Establish a point-of-view, a voice that audiences haven't heard before. Dol Trailer from Andrew Ahn on Vimeo.